She-e Wu has appeared as a solo artist at the 25th, 27th and 30th Percussive Arts Society International Convention; Journées de la Percussion, NancyPhony Festival, perKumania festival, and PercuPassion Festival in France; Bach Symposium/Bach Variation Festival in Lincoln Center; Taiwan Connection concert at Alice Tully Hall, Lincoln Center; International Percussion Festival and InterAmerican Music and Arts Festival Orchestra in Puerto Rico; Festival Internacional de Percusion "Ritmo Vital 2001" and National Percussion Convention in Spain; Fukui Marimba Seminar in Japan; Giornate della Percussione in Italy; Percussion Festival in Greece; Taipei International Percussion Convention, and many other festivals. She has performed with Chicago Symphony Orchestra in Carnegie Hall and Symphony Center, Chicago Chamber Musicians, and Philadelphia Orchestra Chamber Music Series in Pearlman Hall at Kimmel Center. Ms. Wu has performed as guest recitalist and clinician at universities, colleges, conservatories in France, Belgium, Italy, Sweden, Denmark, England, Scotland, Germany, Spain, Greece, Japan, Korea as well as American music institutions and numerous PAS Days of Percussion throughout the United States. Ms. Wu’s composition Blue Identity was written for Frederic Macarez and the Paris Conservatory CNR percussion ensemble. Blue Identity was premiered in Paris at the Journées de la Percussion festival and the American premiere took place at the 27th Percussive Arts Society International Convention. K-PAX, a piece for marimba duo, was commissioned by the Taipei International Percussion Convention in 2002 and was premiered in Taiwan and Japan. UP!, for solo percussion and seven percussionists, received its premiere at The Midwest Clinic in Chicago, December 2009. The world premiere of Ms. Wu's latest composition -- "What the sun would say to the sky", for marimba quartet, was premiered at PASIC 2011 in Indianapolis, IN. Ms. Wu has commissioned and premiered numerous works by Eric Ewazen, Ronald Caltabiano, Robin Engleman, Gerald Chenoweth and many others. Ms. Wu's recent commissions are pieces written by Lee Hyla, Paul Lansky, and Dafnis Prieto. The world premiere of the percussion concerto with wind ensemble written by Paul Lansky is scheduled in January, 2015 with Northwestern Symphonic Wind Ensemble. Ms. Wu has served as a judge for Paris International Marimba Competition, Greece International Competition, Italy International Competition, Atlanta Snare Drum Competition, PASIC Marimba Competition, P.A.S. Composition Competition (Large Percussion Ensemble) and International Percussion Ensemble Competition (College). Ms. Wu's recordings include Marimba Concerto by Eric Ewazen with the International Sejong Soloists, solo marimba CD Snapshot, Suite for Marimba and Flute by Alec Wilder with Flautist Bart Feller, and A set of Songs and Dances by Doug Hill with Gail Williams on horn. Her recording of the No.1, No.2 and No.3 of the Six Suites for Solo Cello by J.S. Bach with Baroque embellishments by George B. Stauffer, is scheduled for release in fall of 2014. A Chamber music recording with American Brass Quintet of all music by David Sampson will be released in fall of 2014 as well. Ms. Wu is a clinician and a recitalist for the Majestic, Mapex, Innovative Percussion, Evans and Zildjian companies. Ms. Wu's signature mallets with Innovative Percussion are available worldwide. Ms. Wu plays on a concert marimba of her design by Majestic. Ms. Wu is Associate Professor of Music and the director of percussion program at Northwestern University. 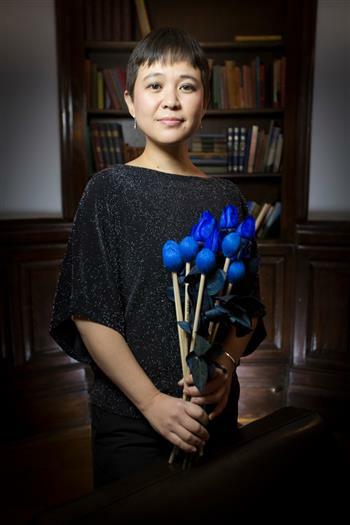 Ms. Wu is also a frequent visiting guest artist at the Royal College of Music in London. She had been on faculty at Manhattan School of Music, Rutgers University and West Virginia University.